It was five years before the turn of the century and major media were warning of disastrous climate change. Page six of The New York Times was headlined with the serious concerns of “geologists.” Only the president at the time wasn’t Bill Clinton; it was Grover Cleveland. And the Times wasn’t warning about global warming – it was telling readers the looming dangers of a new ice age. Just as the weather has changed over time, so has the reporting – blowing hot or cold with short-term changes in temperature. After a while, that second phase of climate cautions began to fade. By 1954, Fortune magazine was warming to another cooling trend and ran an article titled “Climate – the Heat May Be Off.” As the United States and the old Soviet Union faced off, the media joined them with reports of a more dangerous Cold War of Man vs. Nature. The effect of the idea of “climate change” means that any major climate event can be blamed on global warming, supposedly driven by mankind. Spring 2006 has been swamped with climate change hype in every type of media – books, newspapers, magazines, online, TV and even movies. Despite all the historical shifting from one position to another, many in the media no longer welcome opposing views on the climate. CBS reporter Scott Pelley went so far as to compare climate change skeptics with Holocaust deniers. “If I do an interview with [Holocaust survivor] Elie Wiesel,” Pelley asked, “am I required as a journalist to find a Holocaust denier?” he said in an interview on March 23 with CBS News’s PublicEye blog. He added that the whole idea of impartial journalism just didn’t work for climate stories. “There becomes a point in journalism where striving for balance becomes irresponsible,” he said. Pelley’s comments ignored an essential point: that 30 years ago, the media were certain about the prospect of a new ice age. And that is only the most recent example of how much journalists have changed their minds on this essential debate. Some in the media would probably argue that they merely report what scientists tell them, but that would be only half true. This isn’t a question of science. It’s a question of whether Americans can trust what the media tell them about science. The first Earth Day was celebrated on April 22, 1970, amidst hysteria about the dangers of a new ice age. The media had been spreading warnings of a cooling period since the 1950s, but those alarms grew louder in the 1970s. Three months before, on January 11, The Washington Post told readers to “get a good grip on your long johns, cold weather haters – the worst may be yet to come,” in an article titled “Colder Winters Held Dawn of New Ice Age.” The article quoted climatologist Reid Bryson, who said “there’s no relief in sight” about the cooling trend. Journalists took the threat of another ice age seriously. Fortune magazine actually won a “Science Writing Award” from the American Institute of Physics for its own analysis of the danger. “As for the present cooling trend a number of leading climatologists have concluded that it is very bad news indeed,” Fortune announced in February 1974. “It is the root cause of a lot of that unpleasant weather around the world and they warn that it carries the potential for human disasters of unprecedented magnitude,” the article continued. Bryson warned, “It is something that, if it continues, will affect the whole human occupation of the earth – like a billion people starving. The effects are already showing up in a rather drastic way.” However, the world population increased by 2.5 billion since that warning. The claims of global catastrophe were remarkably similar to what the media deliver now about global warming. There were more warnings. The Nov. 15, 1969, “Science News” quoted meteorologist Dr. J. Murray Mitchell Jr. about global cooling worries. “How long the current cooling trend continues is one of the most important problems of our civilization,” he said. If the cooling continued for 200 to 300 years, the earth could be plunged into an ice age, Mitchell continued. A city in a snow globe illustrated that March 1, 1975, article, while the cover showed an ice age obliterating an unfortunate city. He claimed it was not his disposition to be a “doomsday man.” His analysis came from “the facts [that] have emerged” about past ice ages, according to the July/August International Wildlife Magazine. The idea of a worldwide deep freeze snowballed. In Christopher’s novel, England and other “rich countries of the north” broke down under the icy onslaught. “The machines stopped, the land was dead and the people went south,” he explained. Today’s global warming advocates probably don’t even realize their claims aren’t original. Before the cooling worries of the ’70s, America went through global warming fever for several decades around World War II. One year earlier, the paper reported that “the earth is steadily growing warmer” in its May 15 edition. The Washington Post felt the heat as well and titled an article simply “Hot weather” on August 2, 1930. The article began discussing the “wide-spread and persistent tendency toward warmer weather” and asked “Is our climate changing?” Kincer proceeded to document the warming trend. Out of 21 winters examined from 1912-33 in Washington, D.C., 18 were warmer than normal and all of the past 13 were mild. New Haven, Conn., experienced warmer temperatures, with evidence from records that went “back to near the close of the Revolutionary War,” claimed the analysis. Using records from various other cities, Kincer showed that the world was warming. British amateur meteorologist G. S. Callendar made a bold claim five years later that many would recognize now. He argued that man was responsible for heating up the planet with carbon dioxide emissions – in 1938. It wasn’t a common notion at the time, but he published an article in the Quarterly Journal of the Royal Meteorological Society on the subject. “In the following paper I hope to show that such influence is not only possible, but is actually occurring at the present time,” Callendar wrote. He went on the lecture circuit describing carbon-dioxide-induced global warming. The rising mercury trend continued into the ’50s. The New York Times reported that “we have learned that the world has been getting warmer in the last half century” on Aug. 10, 1952. According to the Times, the evidence was the introduction of cod in the Eskimo’s diet – a fish they had not encountered before 1920 or so. The following year, the paper reported that studies confirmed summers and winters were getting warmer. A decade later, the Times reaffirmed its position that “the Arctic pack ice is thinning and that the ocean at the North Pole may become an open sea within a decade or two,” according to polar explorer Col. Bernt Bachen in the Feb. 20, 1969, piece. One of the most surprising aspects of the global warming claims of the 20th Century is that they followed close behind similar theories of another major climate change – that one an ice age. The world knew all about cold weather in the 1800s. America and Europe had escaped a 500-year period of cooling, called the Little Ice Age, around 1850. So when the Times warned of new cooling in 1895, it was a serious prediction. On Feb. 24, 1895, the Times announced “Geologists Think the World May Be Frozen Up Again.” The article debated “whether recent and long-continued observations do not point to the advent of a second glacial period.” Those concerns were brought on by increases in northern glaciers and in the severity of Scandinavia’s climate. Scientists knew of four ice ages in the past, leading Professor Nathaniel Schmidt of Cornell University to conclude that one day we will need scientific knowledge “to combat the perils” of the next one. Some of the sound of the Roaring ’20s was the noise of a coming ice age – prominently covered by The New York Times. Capt. Donald MacMillan began his Arctic expeditions in 1908 with Robert Peary. He was going to Greenland to test the “Menace of a new ice age,” as the Times reported on June 10, 1923. The Atlanta Constitution also had commented on the impending ice age on July 21, 1923. MacMillan found the “biggest glacier” and reported on the great increase of glaciers in the Arctic as compared to earlier measures. Concerns about global cooling continued. Swedish scientist Rutger Sernander also forecasted a new ice age. He headed a Swedish committee of scientists studying “climatic development” in the Scandinavian country. According to the LA Times on April 6, 1924, he claimed there was “scientific ground for believing” that the conditions “when all winds will bring snow, the sun cannot prevail against the clouds, and three winters will come in one, with no summer between,” had already begun. Just like today, the news media were certain about the threat that an ice age posed. In the 1970s, as the world cooled down, the fear was that mankind couldn’t grow enough food with a longer winter. “Climate Changes Endanger World’s Food Output,” declared a New York Times headline on Aug. 8, 1974, right in the heat of summer. “Bad weather this summer and the threat of more of it to come hang ominously over every estimate of the world food situation,” the article began. It continued saying the dire consequences of the cooling climate created a deadly risk of suffering and mass starvation. 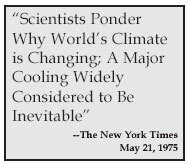 Various climatologists issued a statement that “the facts of the present climate change are such that the most optimistic experts would assign near certainty to major crop failure in a decade,” reported the Dec. 29, 1974, New York Times. If policy makers did not account for this oncoming doom, “mass deaths by starvation and probably in anarchy and violence” would result. Time magazine delivered its own gloomy outlook on the “World Food Crisis” on June 24 of that same year and followed with the article “Weather Change: Poorer Harvests” on November 11. According to the November story, the mean global surface temperature had fallen just 1 degree Fahrenheit since the 1940s. Yet this small drop “trimmed a week to ten days from the growing season” in the earth’s breadbasket regions. Newsweek was equally downbeat in its article “The Cooling World.” “There are ominous signs that the earth’s weather patterns have begun to change dramatically,” which would lead to drastically decreased food production, it said. “The drop in food output could begin quite soon, perhaps only ten years from now,” the magazine told readers on April 28 the following year. Despite Newsweek’s claim, agricultural productivity didn’t drop for the rest of the century. It actually increased at an “annual rate of 1.76% over the period 1948 to 2002,” according to the Department of Agriculture. That didn’t deter the magazine from warning about declining agriculture once again 30 years later – this time because the earth was getting warmer. “Livestock are dying. Crops are withering,” it said in the Aug. 8, 2005, edition. It added that “extremely dry weather of recent months has spawned swarms of locusts” and they were destroying crops in France. Was global warming to blame? “Evidence is mounting to support just such fears,” determined the piece. U.S. News & World Report was agriculturally pessimistic as well. “Global climate change may alter temperature and rainfall patterns, many scientists fear, with uncertain consequences for agriculture.” That was just 13 years ago, in 1993. Baxter titled a chapter in his book “Make Room For Trees, Grains, Vegetables and Bugs on the North Express!” The warming world led him to estimate that within 10 years Canada would produce more wheat than the United States, though he said America’s corn dominance would remain. It was more than just crops that were in trouble. Baxter also noted that fishermen in Maine could catch tropical and semi-tropical fish, which were just beginning to appear. The green crab, which also migrated north, was “slowly killing” the profitable industry of steamer clams. Another subject was prominent whether journalists were warning about global warming or an ice age: glaciers. For 110 years, scientists eyed the mammoth mountains of ice to determine the nature of the temperature shift. Reporters treated the glaciers like they were the ultimate predictors of climate. In 1895, geologists thought the world was freezing up again due to the “great masses of ice” that were frequently seen farther south than before. The melting led to alpine hotel owners having trouble keeping patrons. It was established that it was a “scientific fact” that the glaciers were “surely disappearing.” That didn’t happen. Instead they grew once more. When that era of ice-age reports melted away, retreating glaciers were again highlighted. In 1953’s “Today’s Revolution in Weather!” William Baxter wrote that “the recession of glaciers over the whole earth affords the best proof that climate is warming,” despite the fact that the world had been in its cooling phase for more than a decade when he wrote it. He gave examples of glaciers melting in Lapland, the Alps, Mr. Rainer and Antarctica. U.S. News and World Report agreed, noted that “winters are getting milder, summers drier. Glaciers are receding, deserts growing” on Jan. 8, 1954. The New York Times noted that in 1972 the “mantle of polar ice increased by 12 percent” and had not returned to “normal” size. Furthermore, the permafrost in Russia and Canada was advancing southward, according to the December 29 article that closed out 1974. Was the ice melting at record levels, as the headline stated, or at a level seen decades ago, as the first line mentioned? On Sept. 14, 2005, the Times reported the recession of glaciers “seen from Peru to Tibet to Greenland” could accelerate and become abrupt. Mankind managed to survive three phases of fear about global warming and cooling without massive bureaucracy and government intervention, but aggressive lobbying by environmental groups finally changed that reality. The Kyoto treaty, new emissions standards and foreign regulations are but a few examples. Getting the government involved to control the weather isn’t a new concept. When the earth was cooling, The New York Times reported on a panel that recommended a multimillion-dollar research program to combat the threat. That program was to start with $18 million a year in funding and increase to about $67 million by 1980, according to the Jan. 19, 1975, Times. That would be more than $200 million in today’s dollars. Weather warnings in the ’70s from “reputable researchers” worried policy-makers so much that scientists at a National Academy of Sciences meeting “proposed the evacuation of some six million people” from parts of Africa, reported the Times on Dec. 29, 1974. That article went on to tell of the costly and unnecessary plans of the old Soviet Union. It diverted time from Cold War activities to scheme about diverting the coming cold front. Newsweek’s 1975 article “The Cooling World” noted climatologists’ admission that “solutions” to global cooling “such as melting the arctic ice cap by covering it with black soot or diverting arctic rivers,” could result in more problems than they would solve. More recently, 27 European climatologists have become worried that the warming trend “may be irreversible, at least over most of the coming century,” according to Time magazine on Nov. 13, 2000. The obvious solution? Bigger government. Almost 50 policy and research recommendations came with the report. The news media have given space to numerous alleged solutions to our climate problems. Stephen Salter of the University of Edinburgh had some unusual ideas to repel an effect of global warming. In 2002 he had the notion of creating a rainmaker, “which looks like a giant egg whisk,” according to the Evening News of Edinburgh on Dec. 2, 2002. The Atlantic edition of Newsweek on June 30, 2003, reported on the whisk. The British government gave him 105,000 pounds to research it. Besides promoting greater prosperity and peace, it could “lift enough seawater to lower sea levels by a meter, stemming the rise of the oceans – one of the most troublesome consequences of global warming.” The rain created would be redirected toward land using the wind’s direction. Instead of just fixing a symptom of global warming, Salter now wants to head it off. He wants to spray water droplets into low altitude clouds to increase their whiteness and block out more sunlight. The National Academy of Sciences (NAS) has considered other ways to lower temperatures and the media were there to give them credence. Newsweek on May 20, 1991, reported on five ways to fight warming from the National Research Council, the operating arm of the NAS. The first idea was to release “billions of aluminized, hydrogen-filled balloons” to reflect sunlight. To reflect more sunlight, “fire one-ton shells filled with dust into the upper atmosphere.” Airplane engines could pollute more in order to release a “layer of soot” to block the sun. Should any sunlight remain, 50,000 orbiting mirrors, 39 square miles each, could block it out. With any heat left, “infrared lasers on mountains” could be used “to zap rising CFCs,” rendering them harmless. The media have bombarded Americans almost daily with the most recent version of the climate apocalypse. Global warming has replaced the media’s ice age claims, but the results somehow have stayed the same – the deaths of millions or even billions of people, widespread devastation and starvation. The recent slight increase in temperature could “quite literally, alter the fundamentals of life on the planet” argued the Jan. 18, 2006, Washington Post. In the aftermath of Hurricane Katrina, Nicholas D. Kristof of The New York Times wrote a column that lamented the lack of federal spending on global warming. “We spend about $500 billion a year on a military budget, yet we don’t want to spend peanuts to protect against climate change,” he said in a Sept. 27, 2005, piece. Kristof’s words were noteworthy, not for his argument about spending, but for his obvious use of the term “climate change.” While his column was filled with references to “global warming,” it also reflected the latest trend as the coverage has morphed once again. The two terms are often used interchangeably, but can mean something entirely different. The latest threat has little to do with global warming and has everything to do with … everything. The latest predictions claim that warming might well trigger another ice age. The warm currents of the Gulf Stream, according to a 2005 study by the National Oceanography Centre in Southampton, U.K., have decreased 30 percent. This has raised “fears that it might fail entirely and plunge the continent into a mini ice age,” as the Gulf Stream regulates temperatures in Europe and the eastern United States. This has “long been predicted” as a potential ramification of global warming. Hollywood picked up on this notion before the study and produced “The Day After Tomorrow.” In the movie global warming triggered an immediate ice age. People had to dodge oncoming ice. Americans were fleeing to Mexico. Wolves were on the prowl. Meanwhile our hero, a government paleoclimatologist, had to go to New York City to save his son from the catastrophe. Numerous news reports connected Hurricane Katrina with changing global temperatures. Droughts, floods and more have received similar media treatment. Even The New York Times doesn’t go that far – yet. Unfortunately, that brief brush with caution hasn’t touched the rest of the media. That attitude reflects far more of the current media climate. As the magazine claimed, many of today’s weather problems can be blamed on the changing climate. “Disasters have always been with us and surely always will be. But when they hit this hard and come this fast — when the emergency becomes commonplace —something has gone grievously wrong. That something is global warming,” Time said. The Business & Media Institute (BMI) examined how the major media have covered the issue of climate change over a long period of time. Because television only gained importance in the post-World War II period, BMI looked at major print outlets. There were limitations with that approach because some major publications lack the lengthy history that others enjoy. However, the search covered more than 30 publications from the 1850s to 2006 — including newspapers, magazines, journals and books. Recent newspaper and magazine articles were obtained from Lexis-Nexis. All other magazine articles were acquired from the Library of Congress either in print or microfilm. Older newspapers were obtained from ProQuest. The extensive bibliography includes every publication cited in this report. BMI looked through thousands of headlines and chose hundreds of stories to analyze. Dates on the time periods for cooling and warming reporting phases are approximate, and are derived from the stories that BMI analyzed. What can one conclude from 110 years of conflicting climate coverage except that the weather changes and the media are just as capricious? Certainly, their record speaks for itself. Four separate and distinct climate theories targeted at a public taught to believe the news. Only all four versions of the truth can’t possibly be accurate. For ordinary Americans to judge the media’s version of current events about global warming, it is necessary to admit that journalists have misrepresented the story three other times. Yet no one in the media is owning up to that fact. Newspapers that pride themselves on correction policies for the smallest errors now find themselves facing a historical record that is enormous and unforgiving. It is time for the news media to admit a consistent failure to report this issue fairly or accurately, with due skepticism of scientific claims. It would be difficult for the media to do a worse job with climate change coverage. Perhaps the most important suggestion would be to remember the basic rules about journalism and set aside biases — a simple suggestion, but far from easy given the overwhelming extent of the problem. That last bullet point could apply to almost any major news outlet in the United States. They could all learn something and take into account the historical context of media coverage of climate change. Don’t Stifle Debate: Most scientists do agree that the earth has warmed a little more than a degree in the last 100 years. That doesn’t mean that scientists concur mankind is to blame. Even if that were the case, the impact of warming is unclear. People in northern climes might enjoy improved weather and longer growing seasons. Don’t Ignore the Cost: Global warming solutions pushed by environmental groups are notoriously expensive. Just signing on to the Kyoto treaty would have cost the United States several hundred billion dollars each year, according to estimates from the U.S. government generated during President Bill Clinton’s term. Every story that talks about new regulations or forced cutbacks on emissions should discuss the cost of those proposals. Report Accurately on Statistics: Accurate temperature records have been kept only since the end of the 19th Century, shortly after the world left the Little Ice Age. So while recorded temperatures are increasing, they are not the warmest ever. A 2003 study by Harvard and the Smithsonian Center for Astrophysics, “20th Century Climate Not So Hot,” “determined that the 20th century is neither the warmest century nor the century with the most extreme weather of the past 1,000 years.